Two more weeks and the Shifleys are going on vacation. Mrs. Shife and I are really looking forward to getting away for a few days. Kyle might have his first crush. He will not sit down on the rug at his preschool for circle time until his friend Calliope has picked her spot. It is pretty darn cute watching him wait as patiently as a 4-year-old boy can for her to sit down. Might have to play him the Brad Paisley song Waitin' On A Woman. 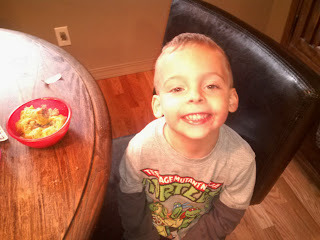 Kyle has to bring a d word this week to preschool, and he told me he wanted to bring me. Made my day. At least I hope d is for daddy and not dummy. The kids had to get their flu shots this week, and Kyle told the nurse that he wanted Hayden to go first. I guess he's following the woman and children first philosophy. Have you ever come across someone wearing the same shirt as you? I hardly ever do and just wonder if my fashion sense is that awful. When it's hot, I wear shorts, a t-shirt, and black Chuck Taylors. When it's cold, I wear sweat pants, a flannel shirt, and Doc Martins. Not exactly going to be featured in GQ Magazine but that's how I roll. Does this sword make Tank look fat? 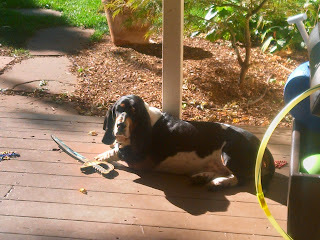 Not the most flattering of angles for our basset hound. I posted this on Facebook but had to share here as well. Mrs. Shife's deodorant was recently confiscated by our TSA agents in training. Gotta keep it under 3 ounces. 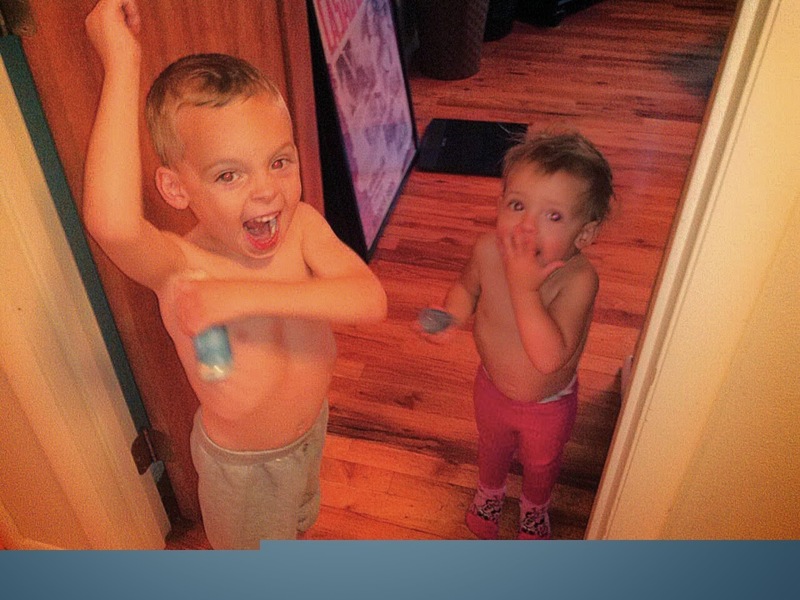 It was way too quiet in the house so I made my rounds and walked in on Kyle and Hayden putting on her deodorant. They smelled wonderful by the way, and Hayden really loved the extra volume it gave her hair. Also, just because I've got a smart phone doesn't mean I know how to get rid of the red eye. Or is it possible they are Terminators in training? And more pictures of the kids for no reason at all. 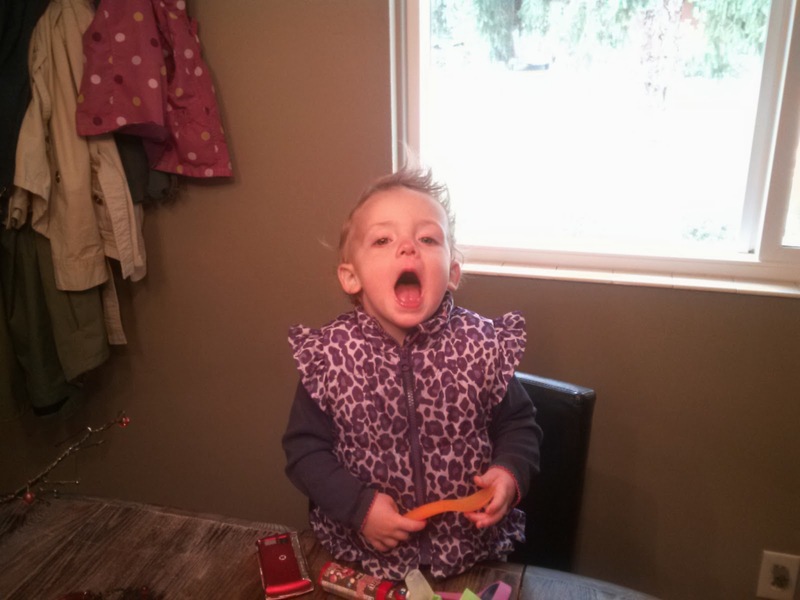 I was working with Hayden on saying "NOOOOOOOOOOOOOOOOOOOOOOOOOOOOOOOOOOOOOOO!!!!!!!!!!!!!!!!!!!!!" when a boy asks her out on a date. And Kyle is smiling because he heard it was Friday. You will never run out of material with those two in the house! Funny stories this week ;-) Have a nice vacation. Good thinking getting Hayden use to say No! good see kyle has good dental hygiene. maybe you can warn him of the danger ju jubes pose to teeth. Never a dull moment in your house. Love the bit about Kyle and his first crush. It's sooo cute. And him wanting to take you as his d word is pretty cool. You have two wonderful children, but you already know that. Poor Tank. Its an unfortunate fact that bassets kind of oooze all over when they lay down. Never very flattering. I love the way Kyle waits for Colliope to sit down first. He's a gentleman and no doubt on his way to being a chick magnet because of it. I had a flu shot day before yesterday. It didn't hurt but it itched and for one day I had an "muskell" like Popeye's. Enjoy your vacation and come back with more great pics of those great kids! Tank may need to scale back on the Twinkies. But he's still looks like he's got the moves like Jagger. Your kids need to take their cuteness down a notch. Way too much cute going on there.